Let us look at the most instantly recognized paper money in the world, the $1 U.S. bill. At an initial look, it might not be important at all, but if you look deeply, you will see hidden treasures within the one dollar bill designed by our Founding Fathers for all of us. It represents what America was initially built on and stands for. What was our Founding Fathers’ message for the future generation of all Americans? George Washington is in the center of the dollar bill, but his face is looking towards the right side. If we look at the right side, we see the seal of the treasury department from 1782 with three signs. The Scales of Justice represents the rule of law, the chevron of 13 stars represents the initial 13 colonies, and the key to the nation will only open when the law is considered at all times. Upon a close look, there are olive leaves on the front face of dollar bill, which represent peace as our truest state as a nation. This peace comes from within us, among all the people who make the nation and keep us united as one nation. There are also two very small owls, one on top of number 1 on the top right and two at the bottom of the dollar bill. This shows that we should always be careful as differences and hate always start so small hidden from the eye and should be kept small if we want to have a peaceful nation from within. On the left side of George Washington is the seal of the Federal Reserve, with the letter in it that represents the place dollar bill was printed as follows: A (Boston), B (Philadelphia), C (New York), D (Cleveland), E (Richmond), F (Atlanta), G (Chicago), H (St. Louis), I (Minneapolis), J (Kansas City), K (Dallas), and L (San Francisco). This letter MUST match the left side serial number. Let us now “turn” to the reverse side of the bill. It was designed by Charles Thompson in 1782. Its final design was approved in 1935 to include the great seal of the U.S.A. in reverse order of what we see today. 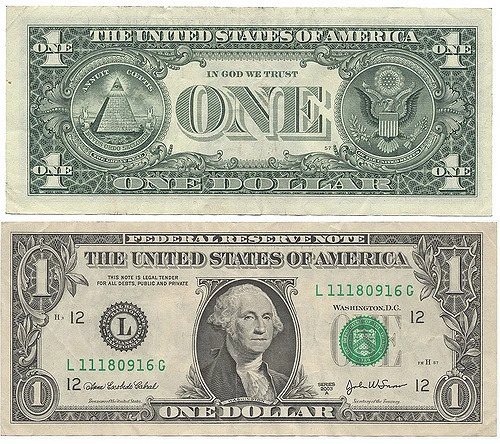 Initially the bald eagle was on the left side of the bill and the pyramid on the right, but President F.D.R. insisted that the order should be reversed so the phrase of The United States would be under the eagle side with E Pluribus Unum: meaning out of many, we are one nation The bald eagle, which represents strength, beauty and longevity, has open wings and so is a rising eagle, and this represents that America is ready to fly to new heights in every aspect of life, with the shield having 13 stripes for the 13 colonies and a solid bar on top to unite them under Congress. The motto “E Pluribus Unum” represents this union and all individuals and cultures united under one nation. E pluribus Unum is made of 13 letters. The eagle has an olive branch with 13 leaves and 13 olives on its dominant right foot and a cluster of 13 arrows on its the left foot. These denote peace and war. The eagle is facing towards the left facing the olive branch, which represents that the U.S. is a country of peace but ready to defend itself whenever necessary. Above the eagle is a constellation of 13 star representing the union. The left side of back of dollar bill is an unfinished pyramid. Pyramids represent strength, and this pyramid was left unfinished to show that our nation remains still growing and that we are continuously building ourselves. We were built on a strong foundation of the pyramid, and we are heading towards the sky. There are thirteen stairs leading to the top of the pyramid. Above the pyramid is the eye of Providence or the all-seeing eye of God which complements the Latin phrase “Annuit Coeptis.” God is crucial in our undertaking (in God We Trust) and “Annuit Coeptis” also contains 13 letters. At the base of the pyramid in Roman numerals is written 1776, the year of Independence Day. At the bottom of it is a semicircular seal with the Latin phrase “Novus Ordo Seclorum,” meaning a new order of the ages, i.e. the role of the U.S. in the world and the beginning of an American era. F.D.R. used modified phrase like this when his Secretary of Agriculture, Henry Wallace, asked for “a new deal of the ages” through his New Deal. On the left and right seals, there is a string of 13 stars extending from the seal toward the edge of the bill. The Founding Fathers put a lot of thought on the Dollar bill to capture the essence of what America stands for. We are a country of immigrants, but despite our different cultures and our melting pot, we are out of many, one nation, protected by law, and we are all carrying a key to life, liberty and the pursuit of happiness. In this goal, the eagle of innovation and dreams lies on the wing, and the dream is protected by peace and strength. Between the Pyramid and Eagle the letter ONE is added to show how these two go hand in hand and how we stand United under one nation and continue to do so despite changes in politics. Happy New Year and enjoy your 2019. Dr. Behyar Zoghi MD, PhD, FACP is triple board certified in Internal Medicine, Hematology and Medical Oncology and is an experienced cancer physician and bone marrow transplant specialist. He practices hematology/bone marrow transplant at the Texas Transplant Institute, a member of the Sarah Cannon Blood Cancer Network. Dr. Zoghi was awarded a patent for a novel therapy in breast cancer and received the Texas Society of Clinical Oncology Award. He is Assistant Professor of Medicine at UT Health Science Center at San Antonio and Chairman of Graduate Medical Education for Methodist Healthcare. His interests include the most recent developments in cancer therapy including immunotherapy, targeted therapy, and CAR-T cell therapy. His holistic approach was the subject of a recent cover page article in MD News magazine. He has been recognized nationally as a Fellow of the American College of Physicians (FACP). He was selected as one of the Texas Super Doctor Rising Stars for 2018 and again in 2019. He received his MD/PhD at Texas A&M College of Medicine, Residency at UT Southwestern Medical Center, and Fellowship at UT Health Science Center at San Antonio. Will America End With A Bang Or A Whimper?